If you are looking for a great place to vacation at the beach, our spacious 3 bedroom 2 bath home is centrally located in a gated community providing 24 hour security, private beach parking, and 2 pools. Rinse off, cool down or take a refreshing shower in our newly installed outdoor shower. In addition to the three bedrooms, there are two sleeper sofas, one in the living room and one in the sunroom. It offers a fully equipped kitchen, five TV's and a DVD player. A golf cart and linens are also included with your rental. There are many activities for the entire family, enjoy the water park located within 1/4 mile on Business 17. Golfers, choose from the many tournament courses located though-out Myrtle Beach, or have fun with the family playing miniature golf. Oceanside Village's own Tupelo Bay, a full executive 18 hole course, lighted par 3 and driving range, or 18 hole miniature golf course with ice cream parlor are located across the street on Business 17. For the avid fishermen, the Surfside Pier is located one mile north and the Garden City Pier is located one mile south of our home. 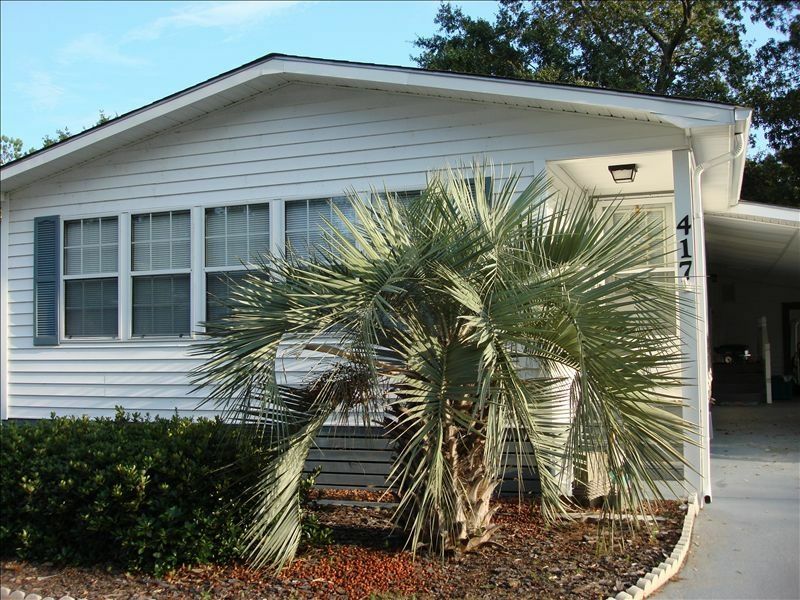 Minutes from Murrell's Inlet, you can enjoy the wonderful selection of restaurants. There is also great shopping at Broadway at the Beach, Barefoot Landing and many other outlets in the surrounding area. (2) Both pools also have kiddy pools. Surfside Beach - perfect spot to launch a family's new chapter. We traveled down the east coast as a family of 9, staying at Surfside Beach for 3 of the 8 night trip and have to say they were great days! Our home was perfect for a large family with plenty of comfortable beds and sofa spaces. We never felt crowded as the large 3 season room easily held everybody while we laughed at movies on the large screen. The kitchen was not cramped and had all the amenities and utensils we needed. Seating was plentiful although not at one table. The 2 bathrooms and outside shower meant nobody in our crew had to wait long for washing up. The washer and dryer were helpful in not only restoring the linens to ready for the next guests- but useful as we did not have the space to pack an abundance of clothes for our week long adventure. The basketball court was a favorite with the guys, while just tooling around in the golfcart will be listed high in the girls' memories. It was easy to get to the swimming pool, the clubhouse, the beach and just sightseeing the neighborhood. The home was just what a family wants- comfortable, welcoming, clean, spacious. Our only challenge was our first attempt to get into the community as there are 2 entries but only one gatehouse. Our hostess was phenomenal in helping us figure that out quickly. She was very responsive at every and any question I came up with and even encouraging when the time came to say goodbye to South Carolina... not easy as we were leaving one kid off to start school hours away from home. This was our first experience not using a hotel and was very positive. We'll do it again. Great 1st experience with VRBO. The house was large, clean and well maintained. The location was great and perfect for my family. The owner was excellent to work with. She responded quickly to my questions and promptly returned my security deposit. Hope to rent from her again. Good property, bad location for us. Great space , 70's style Did meet all our needs, no issues. The only issue for me was the distance to beach, and I accept responsibility for not asking that question, it was 0.8 miles, too far to walk In the heat for Little kids The golf cart was great however as there was 9 of us we also had to load up SUV. I felt like we were in a retirement community with all the rules like "quiet hour after 11, We felt uncomfortable sitting around outside talking and laughing because of quiet hour rule. my son brought his Honda Rukus ( scooter) however could not ride it due to rules! Overall I would recommend it, and I learned to do more investigating ahead of time. Loved the location. It was near everything. Very spacious and the owner is super sweet. Would definitely stay again. If you are looking for a roomy and affordable place for your family vacation, this is it! Everything was clean and ready for us when we arrived, the pool is right close by and the ocean is just a golf cart ride away, which was included. Will definitely stay here again! Thank you for your review. I’m glad everything was to your liking. Good stay - clean place but bring your own supplies! We had a good time staying here for three days. Overall the place was clean. Our favorite part was the living room that looks like it used to be a screened in porch - lots of light and a nice place to hang out while still having AC. Keep in mind renting here means bring your own paper towels, toilet paper, and pretty much everything else except towels and sheets. That's not something we expected, but there's a Dollar General and Circle K within a five-minute golf cart ride. Also having the golf cart included was a big plus, since it's difficult for Ubers or Taxis to get into the gated community if you're trying to go anywhere beyond Surfside or Garden City beach. The golf cart is not rated for road driving. Rates are subject to change depending on season.